Interventional Radiology department headed by Dr Mathew Cherian has world class facilities and boasts o f a Cath Lab with Artiz Zee Biplane & the best tools in the world of CT angiography. Since 1991, it has been doing specialised work in the area of minimally invasive procedures in Brain & Spinal Cord surgeries, Vascular and Non-vascular diagnosis and treatment. 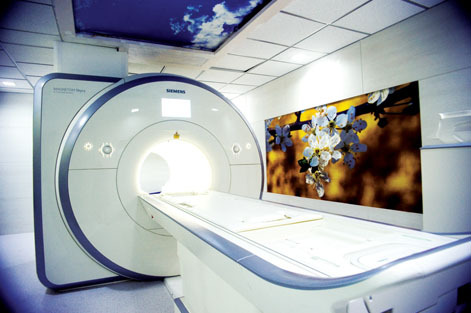 MAGNETOM Skyra 3T MRI is first such scanner in Tamil Nadu. It delivers superior image quality providing accurate results and personalised patient care in very less scanning time. The unique Tim CT Oncology Dot engine can perform whole body oncology examination in just 10 minutes, compared to the conventional time of 30-45 minutes. Skyra MRI scanner also has neuro,cardio, abdomen and angio Dot engines to further optimise the workflow. 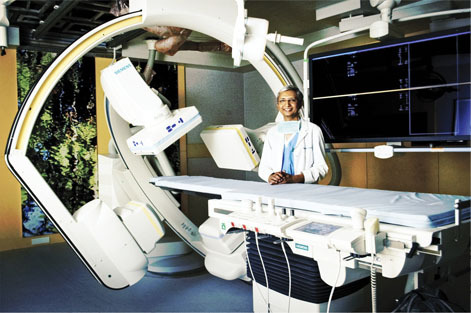 The 70 cm wide bore avoids claustrophobia, thus allowing easy scanning of children, obese, critical and old patients. We have installed top-of-the-line MAMMOMAT Inspiration system. 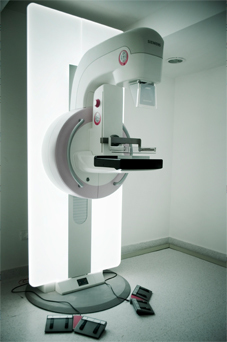 This is a fully digital mammography platform that allows early diagnosis and performs automated stereotactic biopsy. The superior image quality helps to identify the smallest lesion (up to 1 mm) in a breast, which is not possible by conventional methods. Once a lesion is detected, an immediate biopsy procedure can be performed by the stereotactic biopsy method, which can effectively targetthe suspected lesion and extract the sample automatically, without any manual intervention. The entire process takes less than 5 minutes without causing any discomfort to the patient - another benerdover conventional methods of screening. This is one of th e first few centers in the country to install the 500 Volume CT from GE medical system considered to be one of the best tools in the world for CT angiography. BMD or bone mineral densitometry with the DEXA scan is the most reliable way to accurately diagnose osteoporosis. We also have hl-tech digital X Rays installed.